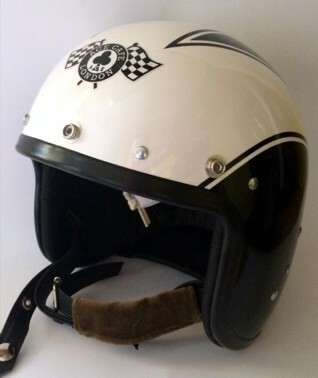 Ace Cafe White Arrow Jet Racer is a Limited Edition classic open-faced “Jet” helmet, built to the original and exacting standards of the Jet-Age! First made popular, from its introduction in 1958, and reflecting the then modern, military “Jet- Age” helmet, Ton Up Boys and Rockers soon adopted this style of “skid lid” or “bone dome” as their own. This carefully crafted “yours for years” helmet, entirely made by hand, is constructed using the same patterns and materials as yesteryear, leather, satin and three layers of cork within a strong, traditionally shaped, fibreglass shell and equipped with visor press studs. NB: This helmet does not meet with modern safety standard and it is intended to be enjoyed as a collectors Limited Edition display item only.